Sorry that I'm late in posting this, but I've been involved in some pretty intense pet rescues lately. That's what I do. Most of the time, I acquire the pets that I adopt out from my wonderful shelter HotRescues from local high-kill shelters in the Los Angeles area, both from local public city shelters and those from the surrounding areas. I feel sorry for the people who work there. They don't always want to kill the animals they have to deal with, but as public shelters they have to take in all pets and often wind up having too many to shelter and care for. Not so with my wonderful HotRescues. My goal in life is to take in as many dogs and cats and sometimes other small animals that I can and find them wonderful new homes immediately--so I can bring in more wonderful animals to rehome. Sometimes the rescues are not what you usually imagine. In fact, some of those are chronicled in my upcoming adventure TEACUP TURBULENCE, which will be available in January 2014. TEACUP involves a major rescue a long distance from L.A. of teacup-sized dogs. There aren't enough adopters of those kinds of dogs in the rescue area. But in L.A., even though we usually have too many little dogs, there's been an ad campaign sponsored by my shelter's benefactor Dante Defrancisco which has led the demand for tiny dogs to new heights. As a result, we bring in as many of the little rescues that we can--via a very special group of pilots and planes who fly them here. Anyway, I'd better get back to my rescue. But please be sure to watch for TEACUP TURBULENCE. 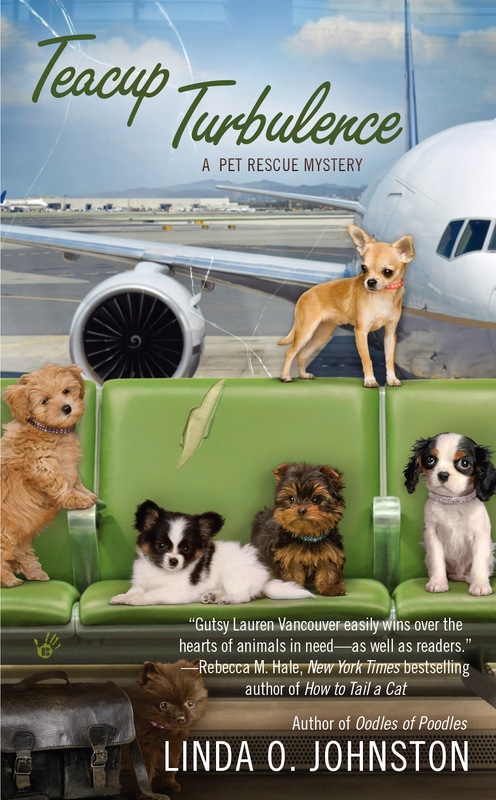 It's a different kind of rescue--although there are lots of wonderful organizations all over the country that help to relocate pets by plane, car or any other way, to help get as many as possible new and wonderful homes. That must have been an interesting flight . . .
Lauren ~ kudos for all the work you do! Definitely an interesting flight, Willow. In fact, there are several in my story. Will be waiting patiently for the arrival of this book. I currently down to 2 small dogs. Only one is a rescue. I drove up to the tippy top of Ohio from the Charlotte, NC area to get him. He is a wonderful dog. My other is an 17 y/o little female. She will be 18 in April. We love dogs and dog stories! Having dogs in your life is a wonderful thing, fermetum--no matter how many or what breed or mix or how they got to you. Rescues are always good, of course. It's great to have senior dogs as family members, too.